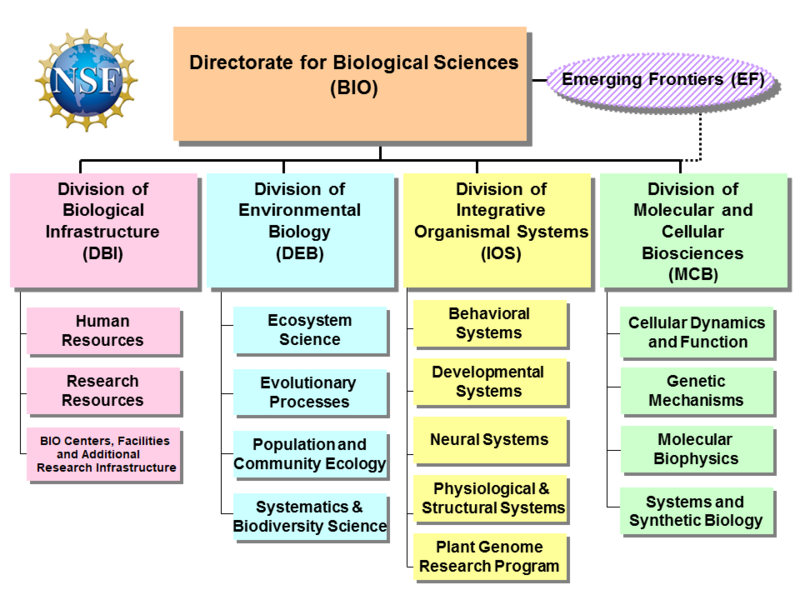 The mission of the Directorate for Biological Sciences (BIO) is to enable discoveries for understanding life. BIO-supported research advances the frontiers of biological knowledge, increases our understanding of complex systems, and provides a theoretical basis for original research in many other scientific disciplines. The Directorate for Biological Sciences supports research to advance understanding of the principles and mechanisms governing life. Research studies extend across systems that encompass biological molecules, cells, tissues, organs, organisms, populations, communities, and ecosystems up to and including the global biosphere. Comprehensive concepts that bridge and unify the diverse areas of biology include complexity, robustness, communication, resilience, adaptability and cooperation. Achieving a coherent understanding of the complex biological web of interactions that is life is a major challenge of the future. This challenge will require that knowledge about the structure and dynamics of individual biological units, networks, sub-systems and systems be compiled and connected from the molecular to the global level and across scales of time and space. Integral to all activities across the directorate is a commitment to integrate research and education, broaden participation, and promote international partnerships. The Division of Biological Infrastructure (DBI) supports development and enhancement of resources for research, human capital, and mid-to-large-scale infrastructure and centers to promote advances in all areas of biological research. The Division of Environmental Biology (DEB) supports fundamental evolutionary and ecological research on species, populations, communities and ecosystems, across all spatial and temporal scales. The Division of Integrative Organismal Systems (IOS) supports fundamental research aimed at understanding organisms as units of biological organization, encouraging the use of integrative, interdisciplinary approaches to solving complex problems in organismal biology. The Division of Molecular and Cellular Biosciences (MCB) supports quantitative and interdisciplinary approaches to deciphering the molecular underpinnings of complex living systems. The Emerging Frontiers (EF) Division supports supports multidisciplinary research opportunities and networking activities that arise from advances in disciplinary research. By encouraging synergy across disciplines, EF provides mechanisms by which new initiatives will be fostered and subsequently integrated into the other Divisions' core activities. To discover more information about BIO's programs, please click “Programs” in the left navigation bar. For information about active BIO funding opportunities including cross-directorate and NSF-wide activities, please click "Funding" in the left navigation bar. For “Dear Colleague Letters” and BIO's guidance on data management plans, please click "Additional Resources" in the left navigation bar. The budget request for the Directorate for Biological Sciences is accessible through the Table of Contents of the NSF Budget Request to Congress. To access current and previous year budget requests, visit the NSF Budget Page.